Before delving into the details of S3 bucket or as it is also called as Amazon S3 bucket, “How to access S3 bucket”, etc., let’s say a few words first about Amazon Web Services or AWS, as S3 is an essential part of it. In brief, AWS is one of the most popular infrastructure of cloud platforms. It provides the following services that you may need - object storage (S3), servers (EC2), databases (RDS), payment processing tools (DevPay), virtualized network tools (VPC and AWS Direct Connect), protocols content placement (CDN), monitoring (CloudWatch), queue (SQS) and much more. Amazon S3 is short for Amazon Simple Storage Server and it is a simple file storage, where objects such as music, videos, photos, documents, etc., are stored into so-called buckets. You can apply different kinds of security policies to the AWS S3 bucket: either make it private, public or share the rights between users. The namespace of buckets is one for all users, that is why according to this fact, S3 bucket name should be unique. So, as it was mentioned above, it is just a simple file storage on the Internet. Nevertheless, we wouldn’t call Amazon S3 simple, as you are provided with just as much storage space as you need. Want 10MB, 1GB or even 5000GB? It does not matter, as there are absolutely no restrictions. However, you should keep in mind the maximum size per file and that is 5 GB. No less important, Amazon Web Services S3 guarantees the safety of data. Any object is on a mandatory basis stored in several places. As soon as the object gets into the storage, S3 takes care of its reliability, checking and, if necessary, increasing the missing redundancy of the data. In addition, S3 also regularly checks the integrity of the stored data by using checksums. If violations are detected, the integrity is restored again with the help of those very redundant data. You can use it to save, retrieve and restore previous versions of the object stored in the S3 bucket. The query retrieves the latest version by default. But the older version of the file can be downloaded by specifying the version of the file. In this paragraph we will provide insight into how to create S3 bucket in the easiest manner, so even a newbie can perfectly deal with it. The first thing that you need to know is that you can create S3 bucket either by using the console or an Amazon Web Services SDK (a set of tools for developers). We will not go into details with AWS SDK but will describe the process when using Amazon S3 console. So after clicking AWS S3 create bucket button, you need to specify the name and the region of your bucket. As it was mentioned above, every Amazon S3 bucket should have a unique name globally and not only within your region. As for the regions, there are so far 18 of them and they are constantly extending. In order to optimize latency, pay less, comply with all applicable laws, rules, and regulations, select the one closer to you. There are several ways to access S3 bucket. The first one is to use Amazon S3 console, the second one is to use URLs, the third one is to use path-style or virtual-hosted-style. If the first two variants are for the users who are not into coding, the third variant is a great solution for the savvy users, who prefer doing it programmatically. You can seamlessly adjust S3 bucket for web hosting and be able to deal with the lifecycle of objects. Amazon S3 bucket provides with an option that allows logging all access to the bucket. Empty the bucket and after that delete it. Within some time the name of the deleted bucket can be used again. Also, in theory, it is possible to create a new bucket under the same S3 bucket name and copy the necessary objects into it. Still, you should be rather careful here, as the name of the removed bucket can be unavailable for some reasons. By default, the number of S3 buckets you can create is 100 for each of your accounts. However, this limit can always be increased at the request of the user. The number of objects uploaded to AWS S3 bucket is unlimited. Despite having a convenient web interface that is offered by Amazon S3 offers there are users who prefer managing their online data directly from their Mac. However, as we all know, many men, many minds. For this purpose, you need to have a decent app, like CloudMounter. 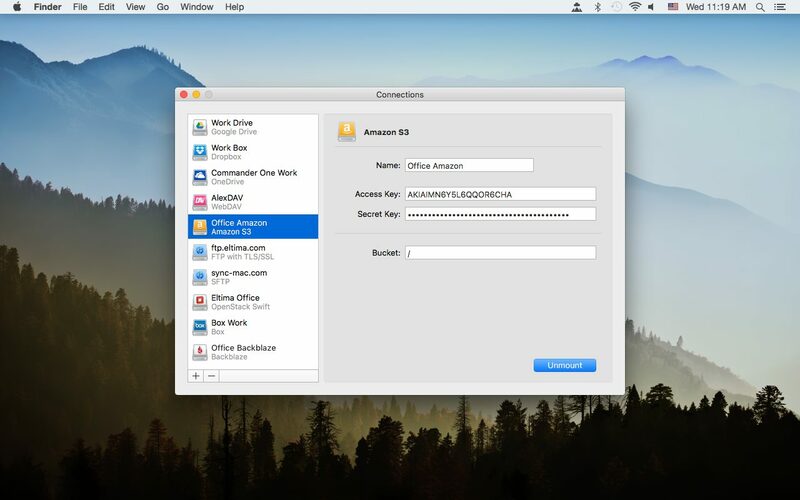 This app is an excellent Amazon S3 client Mac users would find rather handy. Having a flawless integration into Finder, CloudMounter allows you to mount Amazon S3 as a drive on your Mac with no effort, so you can access and deal with all the data stored there the way as if it was stored directly on a hard drive of your computer. Also, according to your requirements, you can choose whether to mount one Amazon S3 bucket or several of them or even the entire Amazon Web Services account. The app supports all AWS regions. In addition to being a perfect S3 client, the app works with a lot of other popular cloud storages as well as FTP, SFTP, FTPS servers. Check out CloudMounter and enjoy working with Amazon Web Services S3.